This entry was posted in 2014 and tagged 1896, 2014, Newspapers, the shrinking American newspaper. Bookmark the permalink. 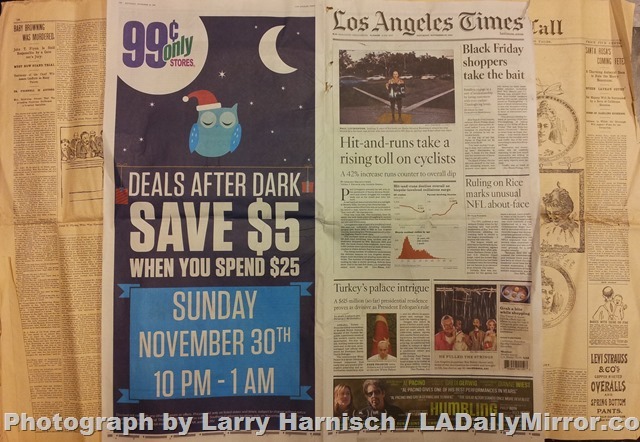 It looks like the L.A. Times has reached tabloid width. Now all they have to do is lop off a few inches at the bottom (about where that bar is) and it will be a full-on tabloid. When I used to read the Times in the 1960s and 1970s I knew it had become a very good (and very hefty) paper, but I had no idea I was living in a golden age that would end in my lifetime. It’s sad to see the newspaper shriveling away to a husk. But on the up side, I’m sure fewer people now get hernias from hoisting the Sunday edition off the lawn. They just get carpel tunnel syndrome from clicking and scrolling their mouse.